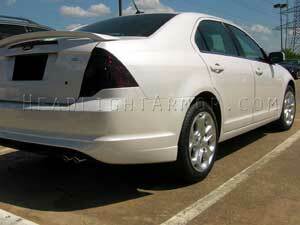 Smoke out your Ford Fusion tail lights with Headlight Armor Smoked Taillight Tints. Available in several levels of smoked from Light / OE Factory Sport Look to Dark Show Stealth Smoke. Smoke out your taillights with our smoked film covers. These are manufactured to fit your 2010, 2011 or 2012 Ford Fusion.